Natural horsemanship focuses on working with the horse's natural behavior, instincts and personality in a clear and kind manner. There are many well-known trainers who practice these methods including: Alexandra Kurland - Clicker Training, Mark Rashid, Brent Graef, Linda Tellington-Jones, Monty Roberts, and Tom Dorrance. Each one of these trainers has their own style and share their knowledge through books and dvds - click on their name to view more information. 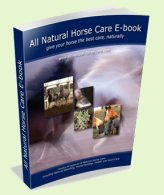 Available to everyone - you can learn how to effectively and kindly work with your horse using these methods. Studies of horses in the wild has given the foundation on which this is based. Body language is used to communicate to the horse and by learning to listen to the horse by watching for subtle moves that indicate understanding, a two-way conversation can be achieved. Sparky loves clicker training and has developed a much stronger bond through positive reinforcement. 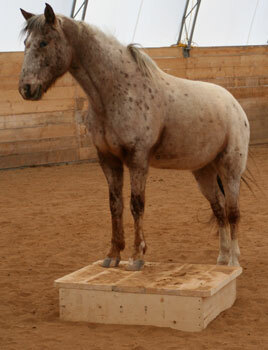 This is his favorite game - standing on the pedestal. It is a truly beautiful sight to see horse and human working as one with trust and respect. That is the essence of true horse-man-ship. Want to make your own rope halter such as the one shown in the photo? These halters are very popular when training your horse using natural methods. Click here for free instructions on how to make one. Training Horses Naturally's website shows you how to discover the natural way to your horse's heart using a combination of natural training techniques and positive reinforcement through clicker training. Click here to visit their website. This comprehensive equine laminitis eBook will enable you to discover the vital information you need to know to help heal your horse now.